I have put up three of my five original novels in Kindle editions: Dad’s Nuke, Kalifornia, and The Orchid Eater. Clicking those titles will take you to Amazon. The front page of this website also links to the titles. So far I am only working on Kindle editions. Once I’ve gotten through this process for all my books, I may move on to other formats. New editions of Neon Lotus and The 37th Mandala are in the works and should be ready later this summer. Most of the work has simply been in the process of cleaning up OCR output of varying quality, which is tedious. On the other hand, it was tons of fun to come up with new covers for these reissues, collaborating with mad scientist/filmmaker Nicolas Huck (of Huckworks). I believe I will have to do a short story collection just so I have an excuse to do another cover! As usual, if you decide to give these a shot and you’re reading along when you suddenly stumble over a typo (or even a word I plainly don’t know how to spell), I would love to hear about it so that I can fix my mistake. The ability to issue updated, corrected versions is one of the most attractive things about digital publishing. If you are so inclined, please drop me a line. And if you do buy a copy–let alone read it–thank you! Fantastic Fiction at KGB has posted their recording of the reading I did there last week. 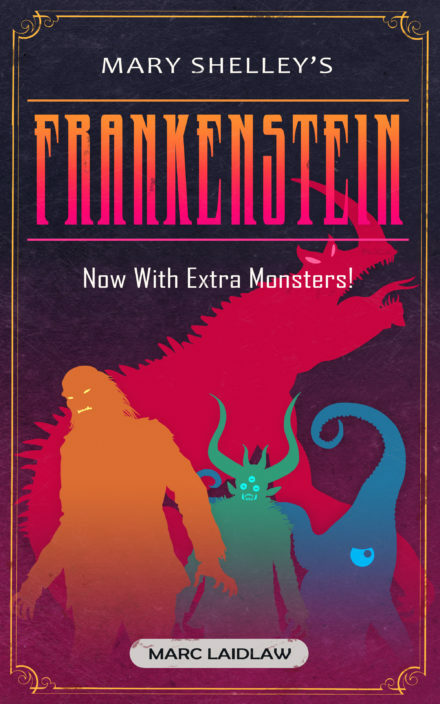 This includes “The Finest, Fullest Flowering” and my new, improved Frankenstein, now with actual monsters. Daniel Braum read an unpublished work, and they hold off posting those until the story has been published. There are also photos of the event! I have started seriously tackling the work of turning my old novels into ebooks. Spent all day on Dad’s Nuke, and got far enough along that I carried on in the first pass of reformatting Kalifornia in the evening. My only plans at the moment are to do Kindle editions. One format has enough headaches, considering how many devices run the app. I might consider doing other versions at some point, depending on how fast I get at the work and how much interest there is in the Kindle versions. 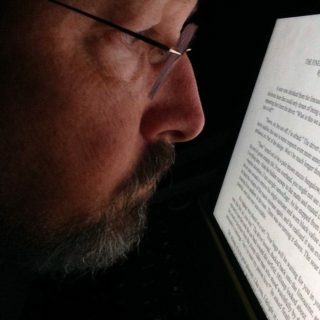 If there is little to no interest in the Kindle editions, then I probably won’t be spending a lot of time on versions that reach even fewer people. 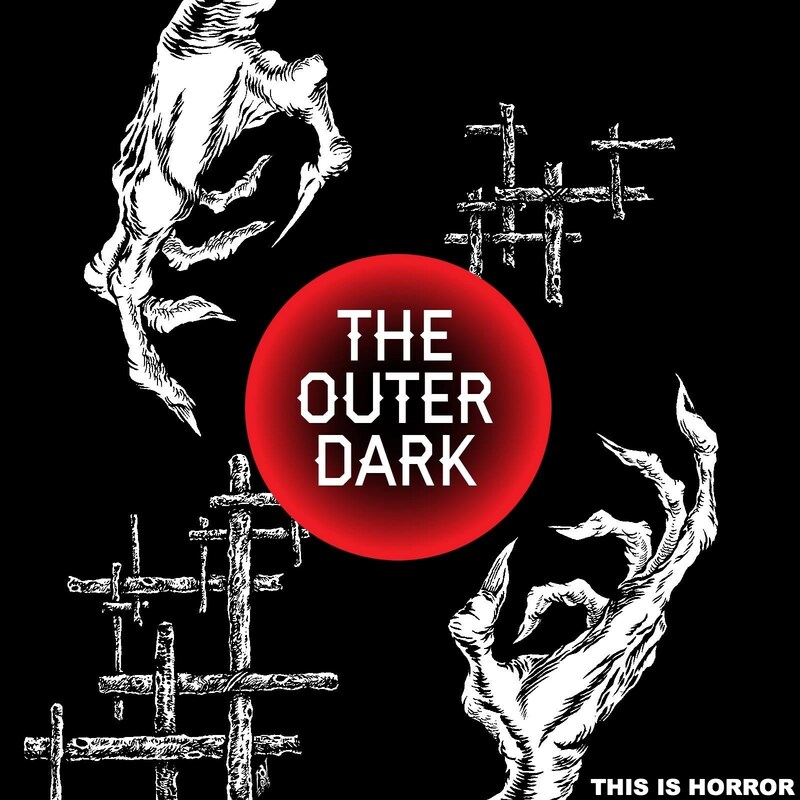 Fans of modern weird fiction may already be familiar with The Outer Dark Podcast, created by Scott Nicolay. The podcast has been on hiatus for a few months but is about to return with a double episode. The first half features a long interview with me, and the second half is an interview with a young author who has recently been winning acclaim and awards. If this is the first you’re hearing of the show, the archives are full of fascinating interviews and well worth delving into. Might as well subscribe to this podcast right away and start catching up before I start yammering tonelessly in your ear, causing permanent damage that will make it impossible for you to hear anything except muffled screams. For the past two days I have been scanning nearly four decades’ worth of manuscripts and other paper-based ephemera. 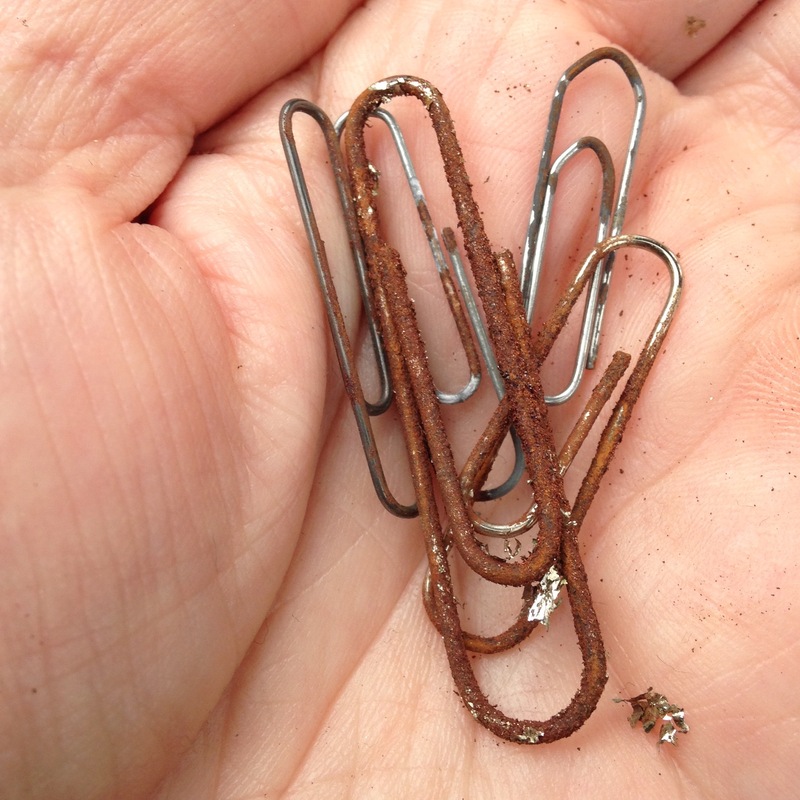 My fingers smell like rusty paperclips; there are copious microinjuries. When a certain variety of paperclip, presumably manufactured in the ’70s or ’80s, gives in to decay, it sheds a shiny outer layer that is twisted, somewhat sharp, and snags in carpet and flesh. I feel at risk for tetanus. And yet, this hazardous undertaking is not unrewarding. I have filing cabinets full of text I generated (or as we old timers might say, “stories I wrote”) in a distant pre-digital era. It has made me nervous to think that almost none of that stuff exists anywhere else, except in increasingly fewer increasingly moldy magazines and paperback anthologies. I’ve now got around 60 old stories scanned and OCR’d, which I am going to be cleaning up and posting here on my website. Most of it will go into the Online Fiction section, though there are a few odds and ends that are harder to categorize. Found the full transcript of an interview with David Lowery of Camper van Beethoven, done during the Key Lime Pie tour, of which only bits and pieces appeared in Mondo 2000. A thing called “Michael J. Fox as Wormboy” which is really just the most extended dream-journal I ever wrote, following a dream so weird that I woke up and promptly spent most of a day writing it down. But mostly it’s just stories, old ones, with some new Author’s Notes appended. Stories such as “Spawn of the Ruins,” my first real publication, from 1977. And “Sneakers,” the only story I sold to the late Charlie Grant for his celebrated Shadows series. I’ve got more to clean up, a lot more, and I’ll post them as I go. Some of the formatting is a real mess. Old dot matrix manuscripts don’t play nice with OCR, it turns out. And if you spot any errors or typos (I am sure there will be plenty), I would be much obliged if you would drop me a line at the contact page and let me know! My short story, “Kapu,” will figure obscurely in Joseph S. Pulver’s forthcoming anthology, Darker Companions, itself a tribute to the work of Ramsey Campbell. “Kapu” was not written to order for the collection, but there is no question that the spirit of Ramsey Campbell animates it and has since its inception. Never has such a short story given me so much trouble, but the thought of coming off badly in a tribute to one of my idols must have scared me into finally getting it all figured out. 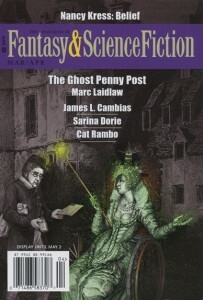 Ramsey was my first editor, having bought my first solo sale, “Tissue,” for his landmark New Terrors collection. He improved that story, and sharpened my own technique, by adding four little words to one sentence. “That’s how it’s done,” I thought, and I’ve been trying to keep that lesson in mind for 40 years. The moment he reached the edge of the shore, he felt the sand give way [add four words here]. The beach was fine and white above, coarse and black below [this sentence needs something]. He stepped back quickly, before his wife and son caught up [need four more words]. The waves crashed in, making a green roil from the horizon to a tumble of lava boulders that edged the cliffs where they touched the water, aslant from jungled peaks high above [four words to come]. Only this thin crescent of sandy beach remained untouched, and even that was being eaten away steadily by the sea [do what Ramsey does]. Join me in awaiting the official announcements of the anthology’s contents and publication date. From what I’ve heard, the line-up of contributors is very strong indeed. That Pulver guy knows everybody! F&SF has officially announced acquisition of my latest short story, “Wetherfell’s Reef Runics,” which is tentatively slated for early 2017. The visitor drowned at Hollows Reef while Ambrose Sabala, mid-snorkel, was making a gleeful mental inventory of the morning’s haul—not of fish, but of books. 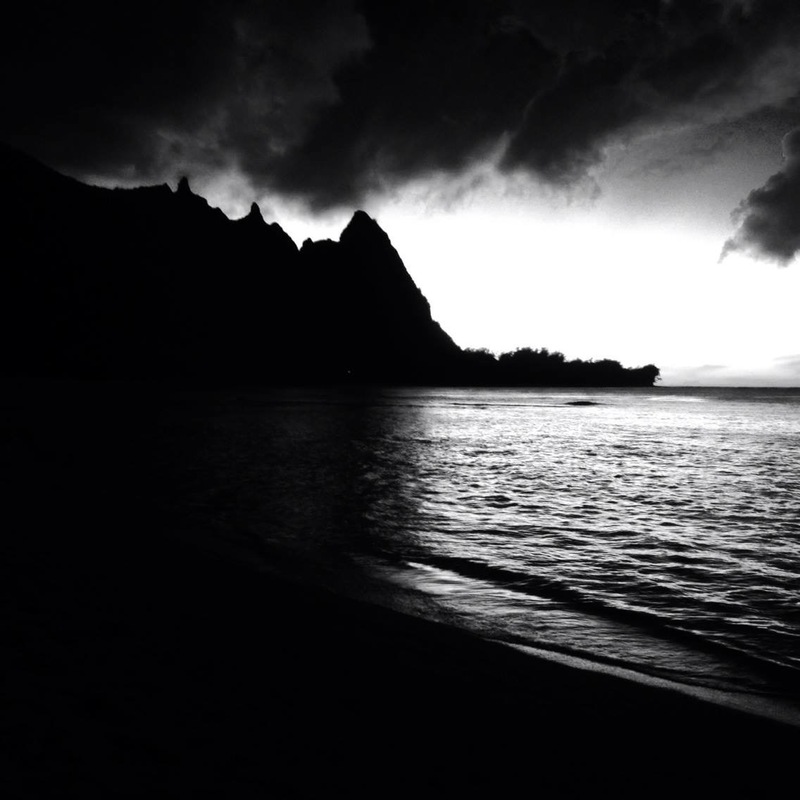 Ambrose drifted over the dull, trampled coral beds with ears full of seawater, snorkel mouthpiece firmly clenched in his teeth, three-pronged pole spear dangling, and did not hear the sirens wailing louder and softer and louder again as emergency vehicles raced along the folds of the ocean highway. He had raided the Friends of the Library bin outside the Schefferville Library that morning, and with one ten dollar bill taken away a stack of first editions in good and even mint condition. A Bret Easton Ellis, stowed in someone’s luggage, then unpacked and left behind—no doubt to make room for a resin tiki or a seashell mug. A biography of Robert Louis Stevenson, also unread. An untouched copy of The Marriage Plot, or anyway one that had been touched only in order that it might flatten a dozen photographs of a bat mitzvah and family surfing lessons. Ambrose pulled his spear back taut on its rubber sling and released it half-heartedly in the direction of a trigger fish, which failed to react except to swerve away slowly from the empty triple threat of his barbed prongs. This is the first of what I hope will be a new series of stories centered on Castaway Books, a secondhand bookshop located on the slightly skewed Hawaiian island of Tauai. 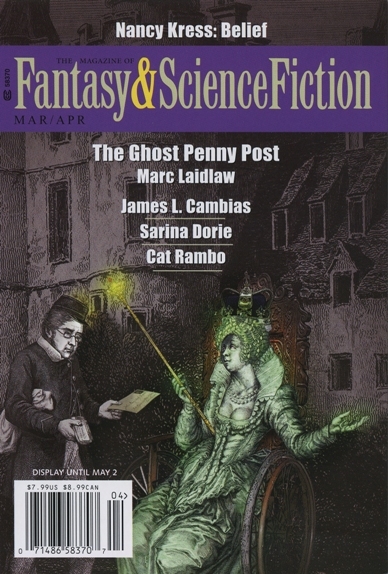 Now available, wherever fine rare periodicals are sold, “The Ghost Penny Post” is the cover story for the March/April 2016 issue of The Magazine of Fantasy & Science Fiction. This beautiful and stunningly weird cover is by Jason Van Hollander. The issue has been reviewed by a few online websites, including Amazing Stories, Tangent Online, and SFRevue. An idea I’d been carrying around for over 15 years, it was finally written in response to a request for stories about videogames; but ultimately, while it does involve games, the video element is nonexistent. It might be considered steampunk thanks to the Victorian period setting, but the only steam in it comes from a kettle. The keen observer might notice that it takes place partly in the bewildering village of Binderwood, referenced elsewhere on this site. There are no coherent observations to be drawn from this, however. I had simply run out of names for made-up places, I assure you. Please don’t see patterns where none exist! Sometime in early 1976, Ray Bradbury came and talked in the Laguna Beach High School auditorium. Afterwards I went down with my friend Robert Gillespie to meet him. We peppered him with questions, and Bradbury commented that he had corresponded with Clark Ashton Smith, at which my enthusiasm must have overcome me, as he reached out and sort of gave me a noogie. Robert never let me hear the end of it: “Oooooh, Ray Bradbury tousled your hair!” Gillespie tortured me with this embarrassing information for quite some time. In the end, I prepared this card and sent it to Bradbury, who kindly signed it. I carried it in my wallet for quite a while.